Dating back to 1795, Oakley Hall was once owned by close friends of Jane Austen. Indeed, the writer made mention of the place in private letters, and some say that she based the character of Lady Bertram on Mrs Bramston who lived there at that time. The novelist Henry Fielding also stayed at Oakley Hall on several occasions. A mix of classic and contemporary, the hotel possesses a total of 18 guest rooms and has been the recipient of some very favourable feedback. Bedrooms include the Courtyard Suite and Executive Rooms within a recently converted stable block dating from the 19th century. 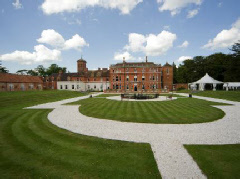 Oakley Hall is set amid a 300 acre estate and even boasts its own clay pigeon shooting area in the West Woods. Located just a few minutes from the M3 motorway, the hotel is within reasonable driving distance of both London and the south coast of England.